Champion, Julie and Caroline Edde. Jeff Koons: La Retrospective: The Album of the Exhibition. Exh. cat., Belgium: Centre Pompidou, 2014, p. 55. Champion, Julie and Nicolas Liucci-Goutnikov. Jeff Koons: La Retrospective: The Portfolio of the Exhibition. France: Centre Pompidou, 2014, p. 144. Gagosian Gallery. Jeff Koons: New Paintings & Sculpture. Exh. cat., Uckfield, England: Gagosian, 2014, pp. 19, 21, 22, 93. Galerie Max Hetzler. Remember Everything – 40 Years Galerie Max Hetzler. Berlin: Galerie Max Hetzler, 2014, p. 114. Koons, Jeff and Norman Rosenthal. Jeff Koons: Entretiens avec Norman Rosenthal. Hove, England: Thames & Hudson, 2014, p. 245 [French Edition]. Koons, Jeff and Norman Rosenthal. Jeff Koons: Conversations with Norman Rosenthal. China: Thames & Hudson, 2014, p. 245 [English Edition]. Lavrador, Judicaël. “Jeff Koons: génie ou imposteur?” Beaux Arts editions November 2014, p. 141. Moderna Museet. Sculpture After Sculpture: Fritsch/Koons/Ray. Exh. cat., Ostfildern: Hatje Cantz, 2014 [Texts by Jack Bankowsky, Thomas E. Crow, Nicholas Cullinan, Made Great, conversation between Michael Fried, Isabelle Graw, Michelle Kuo, Charles Ray, Scott Rothkopf], inside front cover, p. 38. Prat, Véronique. “Jeff Koons avec ses millions, il achète de Manet.” Le Figaro 29 November 2014, p. 54. "Private View: Show Me the Money." Vanity Fair (On Art) November 2014, p. 22. Romanacce, Aurélie. “Jeff Koons: Le Roi Midas.” Arts Magazine December 2014, p. 114 (Edition 2). Thornton, Sarah. 33 Artists in 3 Acts. New York: W.W. Norton & Company, Inc., November 2014, p. 105. Brooks, Katherine. 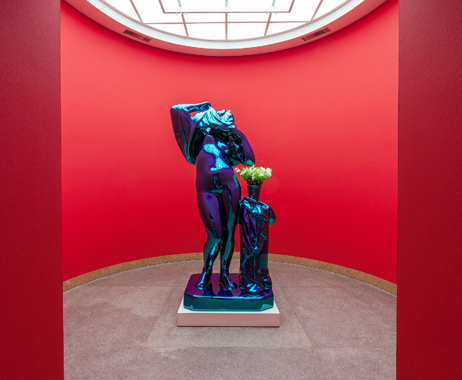 "Jeff Koons Exhibit: 'New Painting and Sculpture' Hits Gagosian Gallery." Huffington Post 12 May 2013. Gingeras, Alison M. "Instant Classic - Alex M. Gingeras on Jeff Koons." ARTFORUM September 2013. Jeff Koons at Almine Rech Gallery. Exh. cat., Belgium: Almine Rech Gallery, 2013, pp. 31, 47, 49-50. Loos, Ted. "In Rome Exhibition, a Poem to New York." The New York Times 20 March 2013. Rome, Palazzo delle Esposizioni. Empire State: New York Art Now! Milan: Skira Editore S.p.A., 2013, p. 110. Russeth, Andrew. 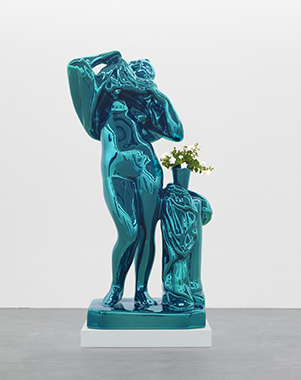 "'Jeff Koons: New Paintings and Sculpture’ at Gagosian Gallery and ‘Jeff Koons: Gazing Ball’ at David Zwirner." GalleristNY 14 May 2013.